DianeClehane.com: DOWNTON ABBEY SEASON THREE FINALE RECAP: HAS JULIAN FELLOWES KILLED OFF THE FANS WITH THE SHOCKING ENDING? DOWNTON ABBEY SEASON THREE FINALE RECAP: HAS JULIAN FELLOWES KILLED OFF THE FANS WITH THE SHOCKING ENDING? “We don’t always get our just desserts,” says Violet to her elated family as they gather in Downton’s library to celebrate all their good fortune in the final minutes of last night’s episode. The dark days are behind them – the estate is saved and Mary has just given birth to the heir Robert has long hoped for. All is right with the world. Matthew, who minutes before stood in his wife’s hospital room holding his newborn son exclaiming he felt as if he “swallowed a box of fireworks,” is dead on the side of the road having been thrown from his prized roadster in a car accident. He had been on his way back to Downton to collect the family and bring them back to see the baby. Moments before the shocking final scene, Mary and Matthew cooed over their baby son in the hospital and seemingly tied all the loose ends of the entire series together. “We’ve done our duty – Downton is safe,” says Mary to Matthew, letting viewers collectively exhale a sigh of relief safe in knowing that this season, which gave us the harrowing and shocking death of Sybil, was going to end on a happy note. And then this. What other show kills off two of its most popular characters and survives? While Fellowes is hoping to replace Sybil’s niche as ‘the young, head strong one’ with Lady Rose next season and may succeed on some level, Matthew, the Crawley heir apparent seems at this moment, irreplaceable. His character, a symbol of Britain’s rising middle class in the 1920s, was the central figure in the series’ sprawling storylines. Will his death drive fans away in droves? In order to keep the show alive, Fellowes will have to go off in entirely new directions shifting the emphasis to other characters which, if this episode is any indication, is going to be a bit of a struggle. At least at first to a large segment of Downton fans. After this episode, which aired on Christmas Day of all days in the UK, viewers were outraged that their favorite television character met such an unexpected end while television critics there crowed the show had jumped the shark. Some even posed the question: Is it time for Downton to bow out gracefully? That’s what made it so devastatingly sad. The randomness coming on the heels of such a blissful moment was unbearably tragic – and felt truer to me than anything else would have. So there you have it. Don’t blame Fellowes for the most shocking and unexpected season finale in years. Matthew Crawley wound up dead in a ditch beside his overturned car his eyes open staring blankly up at the sky, blood running down his face because Dan Stevens has heard the siren’s call of Hollywood. 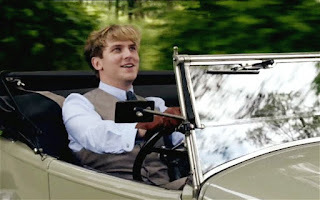 Tom Branson/ Allen Leech will now have to fill the role vacated Matthew Crawley/Dan Stevens and -- don’t shoot the messenger Matthew/Dan enthusiasts – I think he is more than up to the job. It’s one year later from the previous episode and the household, once again fully staffed, is busy getting ready for the family’s yearly trip to the Scottish highlands. Anna has packed the diamond stars and one diamond tiara (“I’d rather be safe than sorry”), Alfred and Jimmy are loading the luggage on to the wagonette. ‘Under butler’ Thomas (that’s Mr. Barrow to you) is doing his best Carson imitation as he hurries along the hall boys. The new maid Edna sneaks a look at Tom as he passes in the hallway. The Crawleys go to visit Cousin Shrimpy, the unfortunately nicknamed lord of the manner, his wretchedly miserable wife, Susan, and – wait for it – daughter Lady Rose who live at Duneagle Castle which makes Downton look like a mcmansion. “It’s the high spot on his lordship’s calendar,” explains Bates to Ivy noting that the family didn’t go last year after Sybil’s death (there are plenty of mentions of Sybil indicating that no one has yet recovered from her death) or during the war – in other words, this trip has been entirely fabricated as a new storytelling device. The visit, which occupied much of the episode, was a jarring departure and for the most part made it seem as if the Downton cast had wandered on to the set of another picture (it was, I admit, very cinematic). I said this last week on the occasion of Matthew, Edith and Lady Rosamund’s visit to the Blue Dragon nightclub, the house itself is an important character in the show and when the principle players are removed from it, they are diminished and the show stalls. We are not amused, Mr. Fellowes. We don’t mind a trip to the village or London now and then but enough of this voyaging into other worlds. “Darling this isn’t 1850 – no one expects me to hide indoors until the baby is born,” says Mary to Matthew when he expresses concern that his eight month pregnant wife is in too delicate a condition to make the journey. The family sets off for the journey with Bates, Anna, O’Brien and Moleseley in tow leaving Tom (who has been charged with looking after Isis) and baby Sybil home with the rest of the servants. Carson and Mrs. Hughes disappoint the staff by telling them that the every piece of silver and every room is to be gone over while the family is away. Edna, the upstart maid, speculates on what Sybil could have seen in Tom and then flirts with him when she finds him alone in the dining room. Upon arriving at Duneagle, Robert, Cora and the rest of the group find the upstairs and downstairs residents of the castle to be perfectly miserable. Shrimpy and his wife constantly bicker, Rose spends much of her time pitting both parents against each other and the dour faced servants in a kind of 'Bizzaro Downton' serve as a reminder to the Downton staff how lucky there are to work anywhere but there. And then there’s the 8 am wake-up call courtesy of the bagpipes. Shrimpy confides to Robert that his marriage is irretrievably broken (“We don’t like each other”) and that he’s accepted a post in India because, unlike Robert, he failed to keep up with the changing times and all the money is gone. “Will you take Rose?” asks Violet later that night after dinner. Not likely, says Shrimpy. How convenient. Edith gets a call from her editor that he’ll be in the neighborhood (how convenient yet again) and he’d like to stop by. He also just happened to have packed his white tie and tails and stalking clothes so he’ll fit right in with the Crawley men. Mary calls him out on it before his arrival but Cora shoots her down as sounding ‘snobbish’ which always makes me laugh. “I was simply questioning his motives for being in the highlands,” says Mary when Matthew walks in on the catfight. See Mary was right, Sybil’s death changed pretty much nothing between them. When Gregson arrives for dinner that night, Matthew observes to Mary: “What a disappointment. He looks perfectly normal.” It turns out that Gregson is lobbying for the Crawley’s approval. “I thought if they liked me, they’d find it easier to be on my side,” he tells Edith admitting that he is in love with her. “I just can’t see a happy ending,” she says. Nor I can. Later that night, Matthew tells Mary he’s talking Edith’s editor out stalking and warns of her of judging him before she gets to know him. “That’s the hallmark of our parents’ generation and I forbid it.” Just be your nice self, he says. “I’ve seen you naked and held you in my arms. I know the real you,” says Matthew caressing Mary’s growing tummy. Back at home, Tom gets it from all sides while holding down the fort at Downton. Isobel invites him to dinner and condescendingly commends him – in the nicest possible way -- for making the transition from revolutionary chauffeur to family member/estate manager “superbly” but warns him, “Don’t be too eager to please. You have a position and can speak to whoever you’d like …” Then maid-turned-stalker Edna follows him to the Grantham Arms where he’s gone to escape the uneasiness he feels having his former fellow servants cater to him. Edna baits him into joining the staff for dinner one night while the family is away. Back at the house Edna presses the case and ask him, “Are you ashamed of who you are or who you were? Is that why you won’t eat your dinner with us?” When he does venture downstairs for dinner Carson is not amused and Mrs. Hughes can tell it was Edna who put the idea in tom’s head in the first place. Back in the highlands, while out fishing Gregson, who I suddenly really dislike, reveals his situation about his institutionalized wife and his feelings for Edith to Matthew who is none to pleased in hearing that his unlucky in love sister in law has once again chosen a clunker. Matthew tells him that while he and even Robert would understand his desire to make a new life for himself, he can’t expect them to allow him to involve Edith in his messy situation. “Not when all you have to offer is a job as your mistress,” says Matthew. “I’m offering my love,” whines Gregson. The night of the Ghillies Ball finally arrives. Shrimpy and his wife (they deserve each other) have a blow out interrupted by Robert, who finds out that his cousin has lost all his money because he didn’t modernize the way Robert did. “What are we going to do about Rose?” Shrimpy asks Robert. I think I have an idea. Upstairs in the ballroom, Anna surprises Bates by reeling. “Isn’t she marvelous?” asks Mary. “Yes, she is marvelous.” Cue Anna and Bates’ love theme. Across the floor, Gregson, who after sharing his conversation with Matthew, tries to say goodbye to Edith and she tells him resolutely, “This is not our last evening.” Uh oh. Mary, who had been warned not to dance at the ball but does anyway, goes into premature labor. She goes back to Downton with Anna and insists Matthew stay behind so as not to break up the party. Reluctantly, Matthew agrees. When the news reaches Downton Mrs. Hughes instructs Edna to make up her room. “Must I?” the impertinent maid (who managed to steal a kiss from Tom by bursting into his room to tell him the family is returning) asks and then tells Mrs. Hughes and Carson she has plans to meet “Tom Branson” for lunch. She has to go, says Carson. Yes, she must certainly does. Susan goes to Cora and tells her that she knows that Shrimpy has asked Robert to take in Rose while the couple goes to India. Cora tells her she won’t do it unless Susan agrees. “I can’t bring her out from Bombay,” says Susan who concedes it’s probably for the best. The two mothers, who both now share the bond of losing daughters, promise to keep each other’s best interest in their heart. Mary gets off the train at Downton and asks to be driven straight to the hospital. “Get a message to Mr. Crawley straight away,” she says to Anna who is headed back to the house. While the rest of the house prepares for the return of the family. Mrs. Hughes shows Edna the door. “What have I done? I’m as good as Mr. Branson,” she whines. “There are rules to this way of life, Edna,” says the wise and weary housekeeper. “And if you’re not prepared to live by them then it’s not the right life for you.” Buh-bye. As Robert and Cora prepare to depart the haunted castle, Robert kisses his wife’s hand and tells her, “I can’t wait to get home.” After seeing the ghost of Christmas yet to come in his cousin, he admits that he now accepts that Downton is going to survive because of “Matthew’s vision.” He goes on: “You knew how lucky we were in Matthew and now I give thanks for him. Most of all, I give thanks for my wife.” As well you should, Lord G.
When the family is sayingg their goodbyes, Edith asks Matthew if he's told Mary about Gregson. He hasn't but adds he knows what has to happen next. Looking like the cat that ate the canary Edith answers, "Oh yes, we know what must happen next." I guess certain married men aren't repugnant after all. Back at the house, Carson, frantic with worry over Mary, is reassured everything will be okay by Anna. She tells him to get Matthew’s car brought to the station so that can drive himself to the hospital when he gets back and then he can come drive back to Downton with the news when he’s ready. Jimmy visits a badly beaten up Thomas and sees the results of his cowardice when he ran off to leave him in the hands of the fairground thugs. Rob James-Collier is fabulous in this scene showing his surprise delight at Jimmy’s concerns. “Were you following me?” asks Jimmy. “I like to keep an eye out,” says Thomas with a shy smile. “I could see you’d had a bit to drink. Yes, I did follow you.” How did Thomas suddenly become so likable? Jimmy tells him, “I could never give you what you want.” I finally like this character when Ed Speleers shows how completely flummoxed the young footman is by this situation. “Right you are, Mr. Barrow. If that’s all, I think I could manage that.” It will be interesting to see where this goes. I don’t think it’s the end of it. Matthew arrives at the hospital. “Can you this hot and dusty traveler come in?” he says from the doorway. Upon meeting his son for the first time, he is beside himself with happiness, “My dearest little chap, I wonder if he has any idea how much joy he brings with him.” The scene is everything fans have waited three seasons to see. When Matthew tells Mary, who is gazing at her son with wonderment, that she’s “such a wonderful woman” she tells him, “I hope I’m able to be your Mary Crawley for all eternity -- not Edith’s version or anyone else’s.” He tells her, “You’ll be my Mary always because mine is the true Mary.” I was crying before I even knew what was going to happen. Believe me, watch this episode a few times and you’ll cry more every time you watch this scene. I promise you. And she gets one. A kiss before dying. As Matthew lies dead on the road, the scene switches back to mother and child with Mary blissfully unaware that the happiest day of her life will forever be remembered as the saddest one, too. And so we must wait a year to find out what happens next. The time frame for the next series will determine what the season is about. Will we see the family in the throes of grief and shock over Matthew’s death? That seems rather duplicative of this season. Will Tom have become Matthew 2.0? Will Edith be in the throes of a secret forbidden affair? How far into the future will they then go? The show has already spanned 11 years and no one looks a day older. As much gnashing of teeth there’s been over season three, I, for one, can not wait for season four. This one has been everything we could have wanted – and more, much more. Well played, Lord Fellowes. Well played, sir.